On Sunday we walked along the Via Dolorosa and visited the Church of the Holy Sepulchre. There’s only one entrance to the Holy Sepulchre Church; other doorways exist, but they’ve been blocked up and the six groups of occupants – Latin Catholics, Greek Orthodox, Armenian Orthodox, Syrians, Copts and Ethiopians – are unable to agree on which, if any, of the other doors should be opened. You just have to hope there isn’t a fire while you’re inside. We had two tours of the church, one with the archaeologist Dr. Shimon Gibson and the other with our local Palestinian Christian guide, Said. In between we visited the Pools of Bethesda. Those who know their New Testament will remember the story of Jesus healing the man who’d been ill for 38 years and was unable to get into the pool when the waters were stirred because he had no-one to help him and someone else always got there first. (John 5) Excavations have revealed the lowest section of the steps he would have had to walk down to reach the pool. These steps may not look much, but I found it amazing that I was gazing down at steps which were there when Jesus was walking around Jerusalem. Everything you walk on today has been built on layer after layer of previous Jerusalems; this is the depth you have to go to to reach what’s left of the city that Jesus knew. 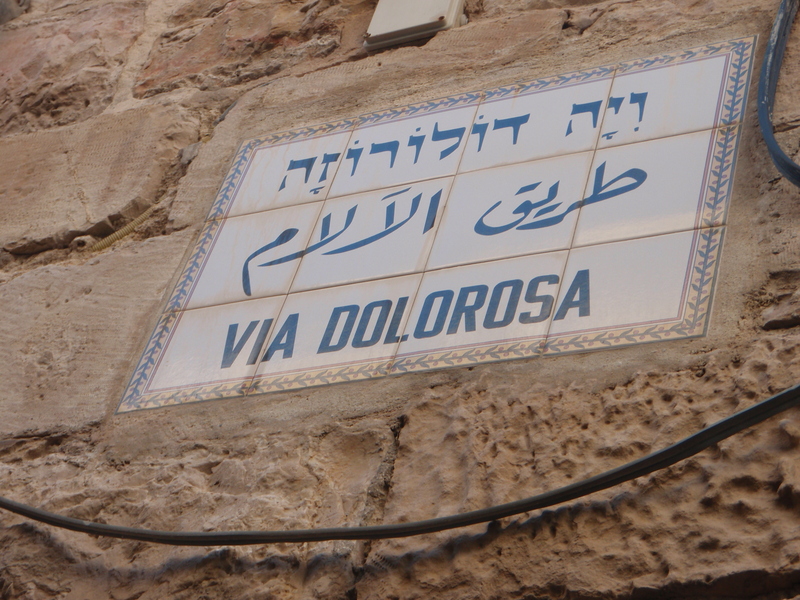 The route of the Via Dolorosa has changed over the centuries, but it now starts at the Chapels of the Condemnation and Flagellation of Jesus, near the Ecce Homo arch. If you want to, you can carry a cross with you as you mark the Stations of the Cross. This is the view of the Holy Sepulchre Church when you reach the 9th Station, where you leave your cross leaning against the wall. Inside the Holy Sepulchre Church are the holiest sites of Christianity; Golgotha, the place where Jesus was crucified, and the site of the tomb where his body was laid. The Holy Sepulchre Church is also known as the Church of the Resurrection because this was where Jesus’s resurrection took place. Before coming to Jerusalem, I was sceptical about the authenticity of these sites, but both tradition and the archaeologists agree that this was very probably the actual site where Jesus died and was buried. In Jesus’s time, it was a disused quarry outside the city walls; what’s left of the rock then known as Golgotha is now hidden beneath altars or behind glass. You can touch it, though; beneath the altar in the Greek Orthodox Calvary there is a hole in the floor through which you can put your hand and touch the rock beneath. The Holy Sepulchre itself no longer bears any resemblance to what it originally might have looked like. There is no sign of a garden; what’s left of the new tomb cut out of the rock is now shrouded in marble slabs and hidden within the Edicule – a structure whose marble exterior has been held in place by scaffolding since the days of the British Mandate. The Edicule is at the centre of the church, beneath the rotunda; you have to queue to go inside and see the tomb and no photography is allowed inside the Edicule (though photos are available on the internet and in books). We were warned that the structure is unsafe, but (like thousands of others) I went inside anyway. The entrance to the Edicule is highly decorated, in Orthodox style, with lamps and icons and gold. There are many more things inside the Holy Sepulchre Church, but these are (literally) the crucial things. I’m still coming to terms with how I feel about having been there; all I can tell you at the moment is that I lit a candle outside the Edicule and I’m very glad I went. It is a dark and peculiar place, full of contradictions and inter-denominational friction, but it is also a place of overwhelming and unconditional love.